Map from ‘Memorandum respecting the frontier between Mohammerah and Turkey’, 1912. Source: British Library, India Office. Online here. A more detailed map compiled by Lieutenant Wilson by plane survey in 1909. The northern end of Abadan Island is in the right bottom corner, including the villages Hajj Faisal, Kut-e Sheikh, Puzeh, Mahairzi and Tuwaijat, the quarantine of Mohammerah (Khorramshahr) and the mosque of Shaikh Jom‘eh. the Amir of Mohammerah Sheikhdom, 1897-1925. 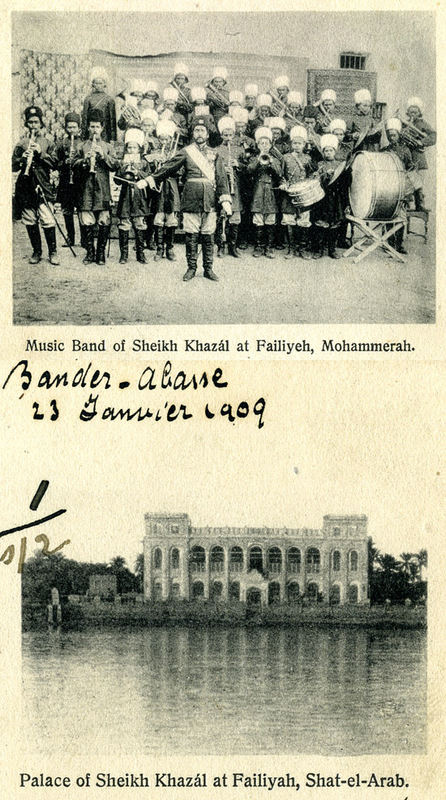 Sheikh Khaz‘al’s music band and palace in Mohammerah (Khorramshahr), 1909. Painting of Mohammerah (Khorramshahr), ca. 1885. Picture of Mohammerah (Khorramshahr), ca. 1917. Shakhat al-Sadeh Bait Kana’an (Muhaisin) 10 huts Do. Shakhat Haji ‘Arrak Mutur (Muhaisin) 20 mud houses Do. Shakhat Haji Dighaifij Do. 20 huts Do. Huz Ridh-yo Do. 10 huts Do. Shakhat al-Hayak or Hayakeh Bait Ghanim (Muhaisin) and Sayyids 40 mud houses. Opposite Muhammareh Town. Do. Farsiyeh Dawalim (Muhaisin) 15 huts. Opposite Muhammareh Town. Do. Kut al-Shaikh Bahraini settlers, Persians, and a few mixed Arabs 150 mud houses; Opposite Muhammareh Town.. There are about 15 shops; Ballams and sailing craft are built, and water-pots, jars, and ‘Abas are manufactured. Kut al-Shaikh was formerly called Kut Faris and belonged to the Ka’ab Shaikhs in the time of their supremacy. Do. Umm al-Jaraidiyeh (2) Nassar (Ka’ab) 10 mud houses and huts Adjoins the last. Ruwais Ahl al-’Aryadh (Muhaisin) 100 mud houses. The residence of Haji Faisal, Shaikh of the Ahl al-’Aryadh. 0.5 mile inland, south of Umm al-Jaraidiyeh. Buzat al-Sanqar – Not a village, but the angle between the Karun river (left bank) and the Shatt al-Arab (left bank), in which the Persian quarantine station and doctor’s house are situated. 0.75 mile below Ruwais. Huz ‘Umar Do. 10 huts Do. Shakhat Bait Hanun Dris (Ka’ab) 30 mud houses and huts Do. Kuwaibdeh Mutur (Muhaisin) 30 houses About 4 miles below Bakhakh and 15 miles from the mouth of the Bahmanshir. Ma’amareh Chiefly Nassar Ka’ab A stretch of date-groves, 6 miles in length on the Shatt al-Arab, containing about 150 scattered huts. Adjoins the last. Oil before the British, somewhere in Bakhtiyari lands north in Khuzestan. Source: Brunei Gallery, School of Oriental and African Studies. Work at an oil well, probably Masjed-e Soleyman north of Abadan. Transport of petroleum products by donkey, Abadan, 1910. This meant that APOC had to buy or lease land from Sheikh Khaz’al, the nominal “owner.” On 23 April 1909, Reynolds, the local APOC representative, approached Sheikh Khaz’al to lease land on ‘Abbadan Island, for a refinery and the pipeline from the fields to the refinery. Already in May 1909, Indian surveyors under Lt. A. T. Wilson had completed surveying the northern part of ‘Abbadan island and they started on the southern part, before a lease had even been agreed upon. Wilson himself called it a preliminary survey of a square mile of desert that APOC needed for the refinery. It was based on his map of ‘Abbadan island that in July 1909 APOC and Sheikh Khaz’al made their decision to lease the land. In March 1910, the British consul at Mohammerah delimited the refinery area and transmitted the map to Sheikh Khaz’al. somewhere in the Fields north of Abadan, probably 1909. However, the dominant tribe in the area, the Banu Ka’b seceded from Ottoman rule and accepted Persian rule as of about 1730. Therefore, Ottoman Turkey provisionally acknowledged Persian sovereignty of the island by the Treaty of Erzerum of 1848, although until 1893 it still claimed that Mohammerah was Ottoman territory. The islands near ‘Abbadan, Haji Salbuq, Bawairdah, Zahir Hoseyn etc, also were acknowledged to be Persian territory. Sheikh Khaz’al, the leader of the Muhaysin tribe that replaced the Ka’b Sheikhs as the leading force in South Khuzestan, wanted to affirm his claim on ‘Abbadan Island. He wanted to develop the island. Although the greater part of the island was barren, it could be irrigated with pumps, which gave the Sheikh hope to make it a valuable property. Therefore, Sheikh Khaz’al wanted “to let a certain portion of Abbadan island for not more than 60 years to foreigners or others with capital to develop agricultural using pumps. In 1901, after much lobbying by Haji Ra’is, Sheikh Khaz’al’s chief advisor, and supported by the British government, Mozaffar al-Din issued a farmān (edict) confirming the right of the tribes living there in the possession of the land. However, the farmān prohibited the tribes from selling land to foreigners, while the Shah promised not sell any part of the land without compensating the islanders. The name of Sheikh Khaz’al was not mentioned in the farmān. Sheikh Khaz’al only kept a copy of the farmān, the original “being deposition in a safe place out of the country.” The farmān was registered in the Legation and delivered to Sheikh Khaz’al by the British vice-consul at Mohammareh. “The advent of cheap oil may make Sheikh Khaz’al’s irrigation scheme possible”, a British report from Abadan stated. “Westwards from Ghofar to Mohammarah the whole island was cultivable; the soil is rather free from salt and of the alluvial type.” Major Percy Cox, the Political Resident in the Persian Gulf opined that APOC should negotiate frankly with the Sheikh, “relying on their representative’s adroitness and our diplomatic assistance when the time comes, to secure rates terms as near fair market rates as possible.” He further remarked that the Sheikh would only be very glad to have his position strengthened by having concrete vested British interests in his territory. But, he concluded, first make sure whether Sheikh “has the right to the sell the land at all on Abadan. It may prove he can do no more than lease it.” In reaction, Capt. Lorimer submitted that it was a mistake to think that the upper part of the island (which APOC wanted to acquire- see map) could be had at a very low price, because it was barren. He wrote that recently land on the banks of ‘Abbadan was sold at 2 liras per jarib, but that the Sheikh would still hold the land and reserve the right to half of the crops. The price of land for non-agricultural uses would therefore be higher. Lorimer suggested that an annual lease might be obtained at better terms by agreeing to pay a lump sum instead of a rent, provided the land would return to the Sheikh at the end of the lease, which he suggested be concurrent with the length (52 years) of the oil concession. Putting down oil pipes, probably 1909. Reza Shah preparing for his campaign against Sheikh Khaz‘al, 1925. “The Early Beginning of Modern Abadan” by Willem Floor is licensed under a Creative Commons Attribution-NonCommercial-NoDerivatives 4.0 International License.